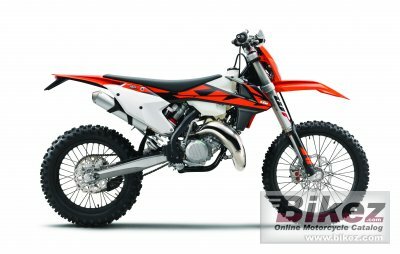 2018 KTM 150 XC-W. Picture credits - KTM. Submit more pictures. �XC� means cross-country. �W� represents its wide-ratio transmission. This compact cylinder with a 58mm bore features a cutting-edge power valve unit with a sophisticated mechanism for the lateral support exhaust ports. Matched to a twin-component cylinder head, it is KTM�s secret to all-round grunt. The layout of the water jackets in the cylinder and head guarantees efficient heat dissipation when you�re riding at the limit. Fuel system: Carburettor. Mikuni TMX. Driveline: 14:50. Primary drive: 23:73. Ask questions Join the 18 KTM 150 XC-W discussion group or the general KTM discussion group. Get a list of related motorbikes before you buy this KTM. Inspect technical data. Look at photos. Read the riders' comments at the bike's discussion group. And check out the bike's reliability, repair costs, etc. Show any 2018 KTM 150 XC-W for sale on our Bikez.biz Motorcycle Classifieds. You can also sign up for e-mail notification when such bikes are advertised in the future. And advertise your old MC for sale. Our efficient ads are free. You are also welcome to read and submit motorcycle reviews.